While everyone was thinking about it, some more freaked out than others, the cougar attack at Tokul Saturday didn’t dampen the festivities and spirts of those riding the Raging River. It was epic. When the thunder clapped and the skies opened for an hour-long downpour I didn’t hesitate along with the other riders because I know I’d never get to shuttle up the 7-mile climb again, so I went for it. And, I’m glad I did. Earlier with the sun shining brightly, dignitaries open the trailhead and unveiled a very nice and big sign. The first loop I rode was the green, a short climb then a flow decent. Then after getting dropped off at the towers, I took my time descending in the greasy conditions at one point skating when the clay-like mud caked up in the tires. Back at the park, I drank beer with attendees and enjoyed the grounds. Raging River is the latest in an effort between the DNR, Evergreen, and various stakeholders to open up more forest land. Waiting out another squall here for a bit before the descent. 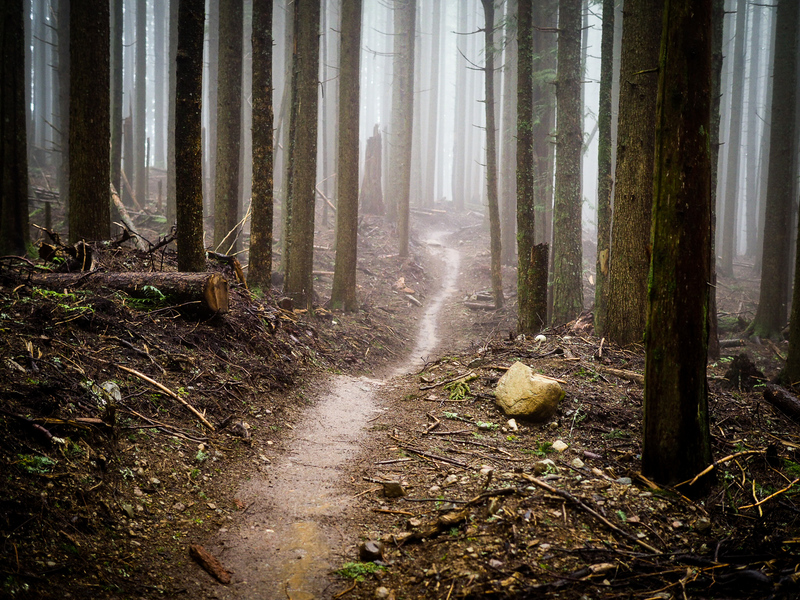 As I’ve been sharing in various posts, there’s a renaissance of mountain biking going on the Pacific Northwest. Miles of new trails are connected existing trails and eventually. they’ll comprise hundreds of miles intersecting with the Mountain to Sound Greenway. My personal fav, Lake Ollalie, is approached from the Iron Horse, a jewel of rails to trails. What this all means is hours of riding for roadies or mountain bikers without ever seeing a car. The new and diverse 17 mile Raging River trail system is the result of an effective public/private partnership between Evergreen MTBA and WA Department of Natural Resources. We successfully partnered to both fund and build phase 1 of these trails, now open to riders of all abilities and offering views, climbs, a backcountry experience, and thrilling descents. 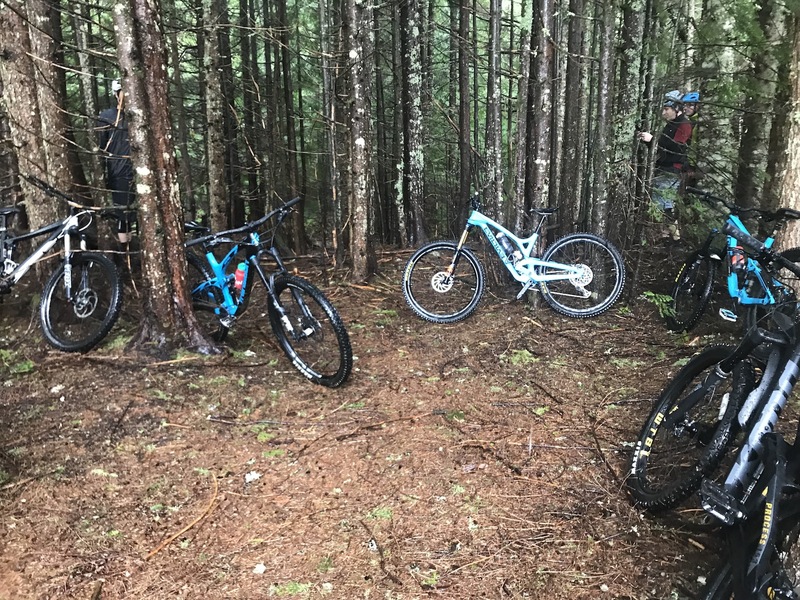 Raging serves a fast growing need for mountain bike resources in the Puget Sound Region, and is already relieving pressure at crowded existing MTB trailheads. DNR is innovating in bringing more recreation to our working forests and is filling a currently underserved recreation need for mountain bikers. Raging offers economic benefits for the communities of Snoqualmie, North Bend and Issaquah, and fosters close to home recreation and healthy lifestyle choices for residents of many Puget Sound communities. Evergreen, DNR, and everyone else couldn’t be more ecstatic with how this trail system turned out, and can’t wait to deliver the next phase to their membership. After riding it, I’m ecstatic too, and encourage you to try it. To get there, take I-90 to exit 27. Then make a right if arriving from the East or left from the West. Park or continue to the parking lot (1/4 mile) up the road in the Snoqualmie Point State Park. The climb is about 45 miles and 95% on singletrack. Since I wrote this story, a fund has been set up for the survivor of the cougar attack.